Peel the potatoes, slice them and lightly fry them in olive oil. They should be half fried and a bit soft. Place them in a flat plate and put some salt. Fry the eggs in olive oil (medium heat) just until the egg white is not transparent. We want the fried egg to be soft and the yolk not overcooked. Take out the fried eggs from the olive oil and place them on top of the potatoes. Put some salt on the eggs as well. You can also put some grounded black pepper on top, but it’s optional. Finally put the Jamón Ibérico de Bellota on top of the eggs and leave it 2-3 minutes so the fat starts to melt and the ham gives you all it’s aroma and texture. 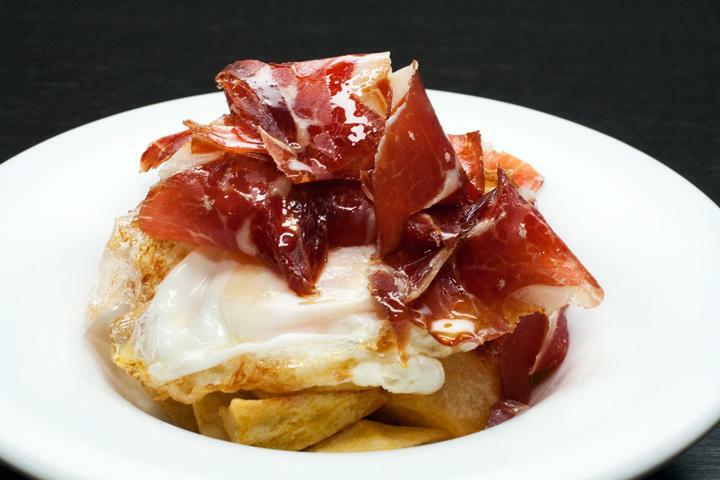 Just before eating, you should break the eggs and mix well with the potatoes and the Ibérico ham. After that, nothing is left but enjoying this simple and delicious Spanish dish!